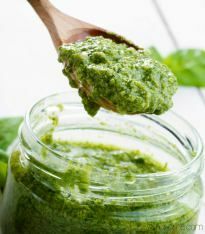 My healthy 5-minute vegan cashew pesto is one of the simplest - and most delicious - things you can make for your pasta. It's also fantastic on baked potatoes, crostini, or even as a dip for chips and other nibbles. Place the cashews into a blender or food processor, and blitz until you have a fine meal. Add the water, a little at a time, and continue to process until the cashews form a thick cream. Add the rest of the ingredients, and blitz for for another couple of minutes, until you have a creamy paste. Serve with your favourite pasta, on top of baked potatoes, or anywhere you'd usually use pesto. For added decadence, sprinkle over a couple of spoonfuls of my vegan parmesan. For variation, add a few sun-dried tomatoes or black olives. If you fancy a change from basil, peas work really well too, and if you're using frozen ones, you don't even need to cook them first, just defrost, and then blitz with the rest of the ingredients. Similarly, a few handfuls of baby spinach or rocket make great basil alternatives. Store any leftovers in the 'fridge in an airtight container for up to three days. I have no idea whether this pesto freezes, as it's never around long enough. If you freeze it, do get in touch to let me know whether or not it worked out!